First published on Nivlesh’s personal blog at https://nivleshc.wordpress.com. cluster master node– this is an Azure managed service, which takes care of the Kubernetes service and ensures all the application workloads are properly running. node– this is where the application workloads run. kube-apiserver– this api server provides a way to interface with the underlying Kubernetes API. Management tools such as kubectl or Kubernetes dashboard interact with this to manage the Kubernetes cluster. kube-scheduler– the role of this component is to decide which nodes the newly created or scaled up application workloads can run on, and then it starts these workloads on them. container runtime– this allows the container application workloads to run and interact with other resources within the node. Now that you have a good understanding of the Kubernetes architecture, lets move on to the preparation stage, after which we will deploy our AKS cluster. AKS uses a subnet to host nodes, pods, and any other Kubernetes and Azure resources that are created for the AKS cluster. As such, it is extremely important that the subnet is appropriately sized, to ensure it can accommodate the resources that will be initially created, and still have enough room for any future updates. AKS uses kubnet by default, and in doing so, it automatically creates a virtual network and subnets that are required to host the pods in. This is a great solution if you are learning about AKS, however if you need more control, it is better to go with Azure CNI. With Azure CNI, you get the option to use an existing virtual network and subnet or you can create a custom one. This is a much better option, especially when deploying into a production environment. In this blog, we will use Azure CNI. The formula below provides a good estimate on how large your subnet must be, in order to accommodate your AKS resources. When using Azure CNI, by default each node is setup to run 30 pods. If you need to change this limit, you will have to deploy your AKS cluster using Azure CLI or Azure Resource Manager templates. This means that the subnet must be at least a /24. For this blog, create a new resource group called myAKS-resourcegroup. Within this new resource group, create a virtual network called AKSVNet with an address space of 10.1.0.0/16. Inside this virtual network, create a subnet called AKSSubnet1with an address range of 10.1.3.0/24. Let’s proceed on to deploying our AKS cluster. Kubernetes uses a separate address range to allocate IP addresses to internal services within the cluster. This is referred to as Kubernetes service address range. This range must NOT be within the virtual network range and must not be used anywhere else. For our purposes we will use the range 10.2.4.0/24. Technically, it is possible to use IP addresses for the Kubernetes service address range from within the cluster virtual network, however this is not recommended due to potential of IP address overlaps which could potentially cause unpredictable behaviour. To read more about this, you can refer to https://docs.microsoft.com/en-au/azure/aks/configure-azure-cni. 4. Click on Next: Review + create to get the settings validated. After validation has successfully passed, click on Create. Just be aware that it can take anywhere from 10 – 15 minutes to complete the AKS cluster provisioning. If you open the virtual network that the AKS cluster has been configured to use and click on Connected devices, you will notice that a lot of IP addresses that have been already allocated. The cluster master node is a managed service and you are not charged for it. You only pay for the nodes on which the application workloads are run (these are those resources inside the new resource group that gets automatically created when you provision the AKS cluster). In the next blog, we will delve deeper into the newly deployed AKS cluster, exposing its configuration using command line tools. Happy sailing and till the next time, enjoy! Containers are gaining a lot of popularity these days. They provide an easy way to run applications, without having to worry about the underlying infrastructure. As you might imagine, managing all these containers can become quite daunting, especially if there are numerous containers. This is where orchestration tools such as Kubernetes are very useful. Kubernetes was developed by Google and is heavily based on their internal Borg system. It is an excellent tool to manage containers, where you provide a desired state for your containers and Kubernetes takes care of everything to ensure the containers are always in that state (for example, if a pod dies, Kubernetes will automatically start a new pod for that container, to ensure that the defined number of pods are always running). Kubernetes also provides an easy process to scale the number of pods or the number of nodes. Soon after releasing Kubernetes, Google partnered with the Linux Foundation to form the Cloud Native Computing Foundation (CNCF). Kubernetes was then made open-source, with the Cloud Native Computing Foundation acting as its guardian. A nice writeup for Kubernetes history can be found at https://en.wikipedia.org/wiki/Kubernetes. Kubernetes is abbreviated as k8s. If you are like me and are wondering how can the word Kubernetes be possibly shortened to k8s? Well, the 8 in k8s represents the number of characters between the letters k and s in the word Kubernetes. With the popularity of Kubernetes soaring, Microsoft recently adopted it for its Azure environment, providing Azure Kubernetes Serviceas a managed service. The service entered general availability in June 2018. If you are interested in reading about this announcement, a good article to read is https://redmondmag.com/articles/2018/06/13/azure-kubernetes-service-ga.aspx. This blog is the first in the mini-series that I will be publishing about Azure Kubernetes Service. I will take you through the process of creating an Azure Kubernetes Service (AKS) Cluster and then we will create an environment within the AKS cluster using some custom docker images. In this first blog I will introduce some key Kubernetes terminologies and map out the scenario that the blog mini-series will focus on. Below are some of the key concepts which I believe will help immensely in understanding Kubernetes. If you think about a pea pod, there can be one or many peas inside it. Treating each pea as a container, this translates to a pod being an encapsulation of an application container (or, in some cases, multiple containers). As per the formal definition, a pod is an encapsulation of an application container (or, in some cases, multiple containers), storage resources, a unique network IP, and options that govern how the container(s) should run. A pod represents a unit of deployment, a single instance of an application in Kubernetes, which might consist of either a single container or a small number of containers that are tightly coupled and that share resources. A more detailed explanation is available at https://kubernetes.io/docs/concepts/workloads/pods/pod-overview/. One key point to remember is that pods are ephemeral, they are created and at times they die as well. In that regard, any application that directly accesses pods will eventually fail when the pod dies. Instead, you should always interact with Services, when trying to access containers deployed within Kubernetes. Due to the ephemeral nature of pods, any application that is directly accessing a pod will eventually suffer a downtime (when the pod dies, and another is created to replace it). To get around this, Kubernetes provides Services. Think of a Service to be like an application load balancer, it provides a front end for your container, and then routes the traffic to a pod running that container. Since your applications are always connecting to a Service (the properties for the Service remain unchanged during its lifetime), they are shielded from any pod deaths. For information about services, refer to https://kubernetes.io/docs/concepts/services-networking/service/. The Kubernetes master (this is a collection of processes) ensures the Kubernetes cluster is working as expected by maintaining the clusters desired state. The nodes are where the containers and workflows are run. The nodes can be virtual machines, physical machines etc. The Kubernetes master controls each node. The diagram below shows the environment we will be deploying within our Azure Kubernetes Service (AKS) cluster. In summary, we will deploy three pods, each running a customised nginx container. The nginx containers will be listening on non-http/https ports. 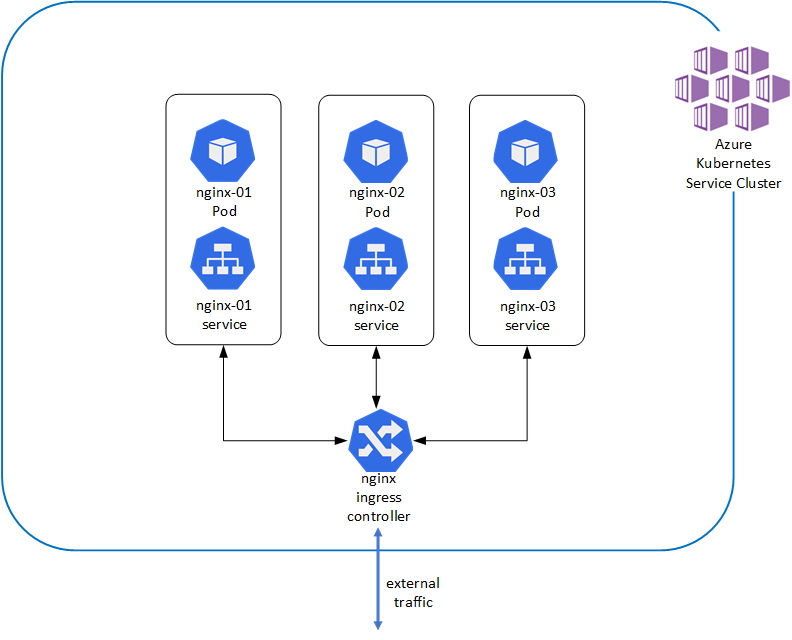 As Kubernetes does not natively provide a way to route non-http/https traffic to services, we will be deploying nginx ingress controllers to enable this functionality. In the next blog in this mini-series, we will deploy the Azure Kubernetes Service cluster. Happy sailing and see you soon!